In conjunction with the JKS 1.25" body lift, we installed a JKS 1" Basic Motor Mount lift to help flatten out the rear pinion and driveshaft angles, further reducing vibrations and, in all likelihood, lengthening the life of this TJ's drivetrain. The JKS instructions leave much to be desired. They do provide torque specs, however, which is nice. Hopefully, this write-up will help augment the instructions if you decide to complete this modification. Despite the sketchy instructions, one person completed the JKS motor mount lift in about three and a half hours. Probably the most difficult part of the job was getting the engine lined back up with the mounts to get the bolts back in their holes. Doing this by yourself certainly will be a challenge but it is do-able. Next remove the four screws that hold the fan shroud in place. This will allow the shroud to "float" while you lift the engine. The top hex-head screws and the lower driver's side screw are easy to reach from above. The bottom passenger side screw, is easier to reach from underneath the Jeep. Place the screws in a safe place. You will re-use them if you install a body lift at the same time you install the motor mount lift as we did. 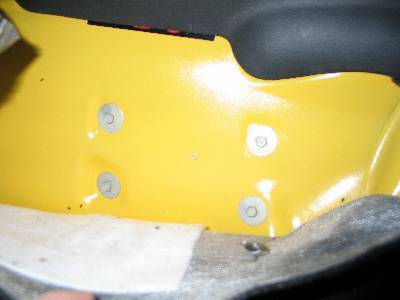 Once the fan shroud is floating freely you will need to disconnect the transfer case shifter from the body. This is done by pulling back the carpet on the driver's side of the Jeep and removing the four screws found on the transmission tunnel just below the shifters. (See Photo #4) I used a cordless drill to remove the screws. This saved quite a bit of time vs. using a ratchet. 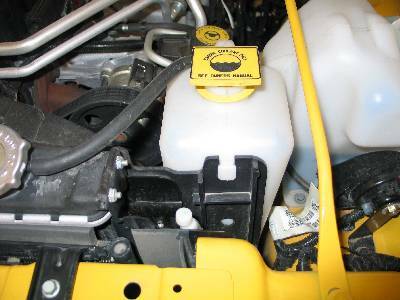 The JKS instructions suggest completely removing the entire mount from the engine. We've talked with several people who did not have to do this. They simply jacked the engine up high enough that they could rotate the mounts on the Through Bolts, installed the extensions and spacers and then rotated the mount back into its original position. We tried this method but found that the JKS bolt extension was too long and the stud had to be ground down. This required complete removal of the mounts. The passenger side was not too difficult. The driver's side was a bit of a pain. Regardless of whether you completely remove the mounts or not, you will need to complete the next steps. Remove the bolts from the top of both mounts and the nuts from the bottom of each mount. 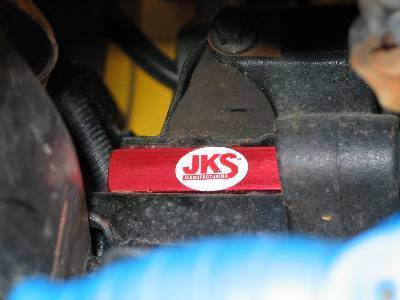 The nuts will be re-used once you install the JKS bolt extension so keep them handy. In the photo above you can see that it works best to use a long extension to reach the passenger side bolt. If you have an air wrench, and can reach the bolt with an extension on your air wrench, this is a great place to make use of it. 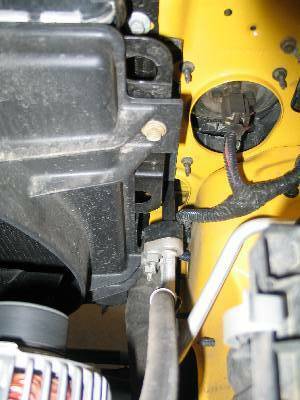 As you can see in Photo #6, there is much less space to remove the driver side engine mount bolt. Again, if you can get your air wrench into the limited space, it will save you quite a bit of time. Our extension happened to be just the right length to fit underneath the engine compartment brace. In the photo above, we're using a deep well socket and two extensions to reach up and remove the passenger side engine mount stud's nut. We used the deep well socket for two reasons; first, because the stud extends quite a ways past the nut and, second, it gave us a little bit of extra reach. In the photo above, that a ratchet with no extension just fits in the space available to remove the Through Bolt on the passenger side. The driver side is even tighter. We had to remove the passenger side to grind down the stud so the JKS bolt extension would be flush with the spacer. (see Photo #10) Use an 18mm box end wrench on the nut and rotate both wrenches in opposite directions to remove and replace the Through Bolt more quickly. As mentioned, we had to grind down the stud on the passenger side mount to allow the JKS bolt extension to fit flush with the spacer. (see Photo #11). This, of course, required removing the entire engine mount assembly. I used a bench grinder to do the grinding and then placed the mount in a vise to install the JKS bolt extension. Although the photo above is a little blurry you can see that the larger section of the JKS bolt extension does not extend past the bottom (top in the photo) of the spacer. It is important that the larger section of the bolt extension not extend past the spacer so that the spacer seats properly in place. Caution: Do not over-tighten the bolt extensions to get them to "flush-up" with the spacer. They should only be torqued to 35 ft/lbs. Over-tightening may strip the threads on the stud or the extension or both. Once the JKS bolt extension is installed slide the spacer over the extension and line up the remaining spacer hole with the bolt hold in the engine mount. If you completely removed the Through Bolt, re-install the engine mount first and then re-install the Through Bolt. We found it much easier to wiggle the engine around to line up the Through Bolt than it was to line up the stud and the bolt holes. Also, we slid both spacers over the extensions and lined them up with the frame rail extensions as best we could before SLOWLY lowering the jack. We lowered the jack a few fractions of an inch and checked and double-checked the stud and bolt hole alignment as we did so. When the stud was about 1/4" into its hole we inserted the two new, longer bolts from JKS into their corresponding holes and started them by hand. We also put the nuts on the studs by hand. This secured the engine so it would not fall while giving me the wiggle room we needed to reinstall the Through Bolt. Having a second person to help with reinstalling the Through Bolt would definitely have been nice. In the photo above, you can see the passenger side spacer (the red block of aluminum) in place between the frame rail extension and the original engine mount. In the photo above, you can see the driver side spacer (the red block of aluminum) in place between the frame rail extension and the original engine mount. Once the JKS spacers are installed, reinstall your fan shroud and make sure you have enough clearance for the fan to rotate (if you also installed a body lift you should be fine) and clearance above the lower radiator hose (near the left-center of the photo). If you do not have fan or radiator clearance you will either have to modify or relocate your fan shroud. Since we did a body lift at the same time as the motor mount lift our clearance was fine and we were able to reuse the original mounting hardware for the fan shroud. 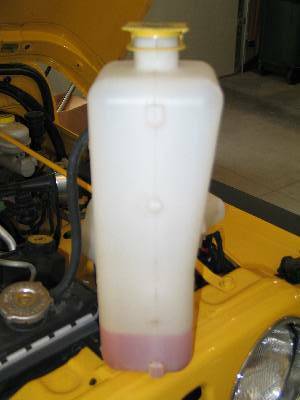 Reinstall your radiator overflow bottle, torque all bolts/nuts to spec and you're done. Start your engine and check for any vibrations. If you have vibrations the JKS bolt extensions may not be flush with the bottom of the spacers. Installing the SkyJacker TC shifter bracket also worked well and makes a lot of sense in conjunction with a MML and BL. The SkyJacker bracket, if you are not familiar with it, replaces all of the existing TC shifter mounting hardware with a bracket that mounts only to the transfer case. This removes the TC shifter's connection to the body of the Jeep - not the best design in the first place - and improves TC shifting. Check here for our SkyJacker TC shifter bracket write-up.